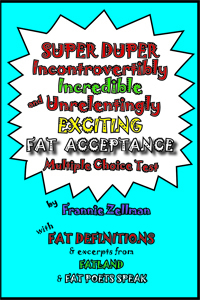 The Super Duper Incontrovertibly Incredible and Unrelentingly Exciting Fat Acceptance Multiple Choice Test & Fat Definitions were written by Frannie Zellman (author of the novel FatLand & co-author & editor of Fat Poets Speak: Voices of the Fat Poet's Society and Fat Poets Speak 2: Living and Loving Fatly) for a skit she and other members of the Fat Poets' Society performed at the summer 2009 convention of the National Association to Advance Fat Acceptance (NAAFA). Pearlsong Press offers it as a free PDF ebook. Download it, share it with friends, and enjoy! 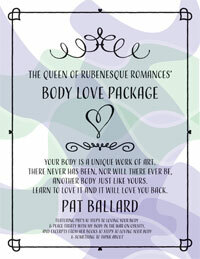 This free PDF ebook features Pat Ballard's 10 Steps to Loving Your Body (No Matter What Size You Are) & Peace Treaty With My Body in the War on Obesity, as well as excerpts from her books 10 Steps to Loving Your Body & Something to Think About. Click here to download the FREE Splendid Seniors Among Us PDF ebook. 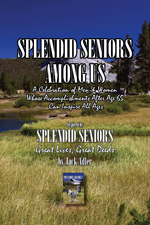 In Splendid Seniors: Great Lives, Great Deeds, author Jack Adler recognizes 52 people throughout history who accomplished great things after age 65. In celebrating the publication of this inspiring book, Pearlsong Press decided to honor some of the many Splendid Seniors still among us. We sought nominations nationwide of people whose accomplishments after age 65 warrant special recognition and can serve as an inspiration to others. Creativity, productivity, charity, political action, community involvement—any and all areas of life and personal expression were reason for nomination. Our plans were to honor one Splendid Senior Among Us a month for a year, starting in March 2007, when Splendid Seniors: Great Lives, Great Deeds was published. The seniors so distinguished were announced on the Pearlsong Press blog at www.pearlsongpress.com and via press releases to their hometown media and mayors' offices. They received a frameable certificate declaring their “Splendid” status and a free autographed copy of Splendid Seniors: Great Lives, Great Deeds. During that period there were three months we didn't receive nominations that fit our criteria for "Splendid" status (which, admittedly, was purely of our own design and preference). Still, we ended up with nine wonderful people recognized as "Splendid Seniors Among Us" and included in the SSAU PDF ebook published in April 2008. The ebook contains information about each of the honorees and the reasons they were chosen, excerpts from Splendid Seniors: Great Lives, Great Deeds, a message from the publisher, and information about Pearlsong Press and our books. You are welcome to share the ebook with anyone you wish. Click here for a list of the SSAU honorees with links to their press releases and peeks at their certificates. Download the ebook by clicking on the button above. Click here to go to the Pearlsong Press webpage containing links to mp3 recordings of the hour-long shows | Or go to the show blog at www.healthateverysize.info. Click here to go to the Pearlsong Press webpage containing links to mp3 recordings of teleconference Conversations with Pearlsong authors.